Do you use your mobile phone or tablet computer only for making calls and having fun? Now you can use your spare time to your advantage! Think out the style of your website or develop the visual concept of your future application with the help of Mockups for Android. 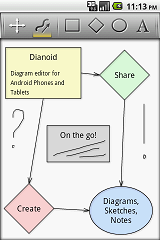 Draw the internal architecture of your software or website using Dianoid, our diagram editor for Android. And last, but not least, implement your Web project using our text / web editor for Android - Webmaster’s HTML Editor. Lots of work or lots of ideas? Do you want to design websites while staying in your comfortable armchair? Now you can do that on your Android tablet or mobile phone! 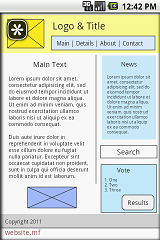 Webmaster's HTML Editor is a "handheld" IDE for designing websites. Entering text on a mobile phone or tablet computer is pretty challenging, so we furnished our application with the buttons for quick input of text elements; besides, we implemented syntax highlighting and code completion. 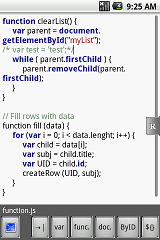 Surely, all these things and the Undo/Redo feature can greatly speed up your work with the source code! When you are designing the website, the Quick Preview feature lets you easily check the result of editing the HTML or CSS code. Have you ever drawn a presentation diagram without using a desktop computer or laptop? Now, thanks to Dianoid, you can do that on your Android mobile device! Using our handy diagram editor, you can quickly build diagrams whether you are traveling or sitting in a comfortable armchair. The Pro and Lite versions let you create an unlimited number of diagrams, flowcharts, mind-maps, and even freehand sketches. When diagrams are exported, the Lite version adds a watermark to each of them. The Pro version can export diagrams into graphics formats without adding watermarks; it also lets you easily email diagrams to your colleagues or friends, or post them on Facebook or Picasa. You don’t like to waste your time? Whatever you are doing — traveling or sitting comfortably in an armchair — use that time to think out your ideas and implement them in a prototype! Mockups for Android is a user-friendly application that lets you quickly prototype an application or website. You can choose from several basic design elements for your wireframe prototype. When prototyping, you can change the sizes and colors of UI elements, as well as place them on the screen as you like. When the prototype is complete, you can easily save it as a ready-to-print image and email it to your colleagues or friends, or post it on Facebook or Picasa. Being a Space Academy graduate, you must safely deliver colonists to new planets. Take care! Four star systems, meteor showers, asteroids, and simple controls. Who will make it and will be the first one to reach the planet? Four spaceships compete in each race. Only the winner will be admitted to the next race!